Back in December, the only thing equity investors could wish for was not another 2018. As we approach the end of the first quarter, European equities had a decent bounce but have now entered a turbulence zone. Worrying signals have been mounting lately -- last week’s PMIs were grim -- and it wasn’t surprising to see a pullback on Friday after such a rally. Fears are growing. Last week saw the biggest weekly volatility spike in a year. The V2X Index, while still quite low at around 17, is at the highest level in two months, so that’s something to keep in mind in a shaky environment. It’s not just technical. 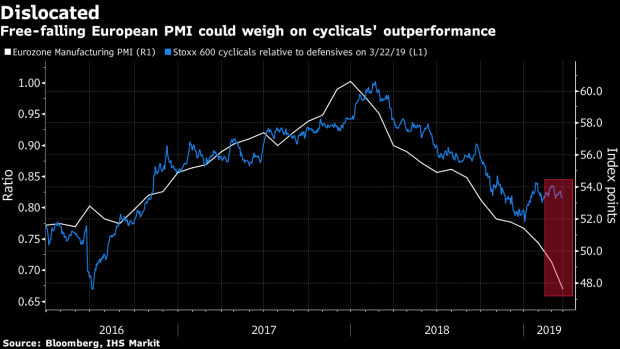 The macro economic picture has continued to deteriorate with no bounce in European manufacturing activity, and growth downgrades from the ECB and rating institutions. The global environment isn’t great either. U.S.-China trade talks have stalled, with no firm date in sight for an agreement, and an ever-dovish Fed has increased fears that a U.S. recession could be around the corner. This raises the question about further outperformance for cyclicals. They’ve stalled relative to defensives since January. Sector-wise since January, all industries in the Stoxx Europe 600 benchmark are in green, and 13 out of the 19 sectors enjoy double-digit gains. Retail tops the chart, with Ocado and Zalando showing advances in excess of 50 percent, and heavyweight Kering climbing more than 20 percent. Food & beverages have been in demand, particularly spirits and beer producers. Basic resources did well, boosted by rising metal prices such as iron ore, as supply and stockpiles tightened, and Chinese macro data wasn’t as bad as feared. There was a turnaround in March for this year’s laggard: telecoms. The sector has been a major outperformer with a 6.4 percent gain. Have investors finally decided to answer the value call? This looks like the only major rotation toward depressed sectors, as travel & leisure and media show no signs of a rebound. Meanwhile, banks’ hopes of a comeback were dampened by the ECB and the euro’s weakness. Country-wise, Italian shares continued to rally and outperformed most indexes, while Europe has fared better than emerging markets. The never-ending Brexit saga is still a major drag for U.K. equities, as the pound is standing firm near this year’s high. The next few weeks will be critical, as it seems Brexit could finally reach a definitive outcome. After Friday’s slump in equities spread to Asia, with Japanese shares heading for their biggest slide year-to-date, Euro Stoxx 50 futures are trading down 0.5% ahead of the open. Watch the pound and U.K. stocks as Sunday newspaper report Prime Minister Theresa May is under threat of being ousted. The Parliament will vote on Monday on plan to take over the Brexit agenda, while a petition calling for Article 50 to be revoked has surpassed five million signatures, and after an estimated one million took to the streets of London to demand a second referendum. Watch trade-sensitive sectors as representatives from Washington resume negotiations in Beijing. Trump has said a deal is “close,” but there’s still a significant risk that talks could break down over key issues. Watch the euro as increase to government spending in Germany and French tax cuts introduced in response to the recent Yellow Vest protests will give the single currency area its biggest fiscal uplift for a decade, according to analysts at Morgan Stanley. Watch Turkish stocks after the lira slid as much as 5 percent on Friday, and the country’s central bank attempted to reassure investors over the weekend that a recent slump in its foreign reserves doesn’t reflect any extraordinary developments. President Recep Tayyip Erdogan commented that bankers will “pay a heavy price” for last year’s currency frenzy. Jefferies says a more complex historical performance comparison and scant organic deleveraging at Wood means the risk to the oil services firm’s dividend is increasing. The broker cut co. to underperform from hold, and trimmed PT to 480p from 550p. Consensus appears to be that banks pose a threat to Italian insurer Generali, but Jefferies argues the opposite would seem to be the case. In effect, as spreads widen, insurers become more capital competitive than banks and Italy’s insurers would benefit most, according to the broker.